Abundant cascading blooms with flourishing leaves and splashes of colors trailing over windows and balconies of houses are a true feast for the eyes. They make your house more inviting and gives a refreshing view for you and your guests to enjoy. 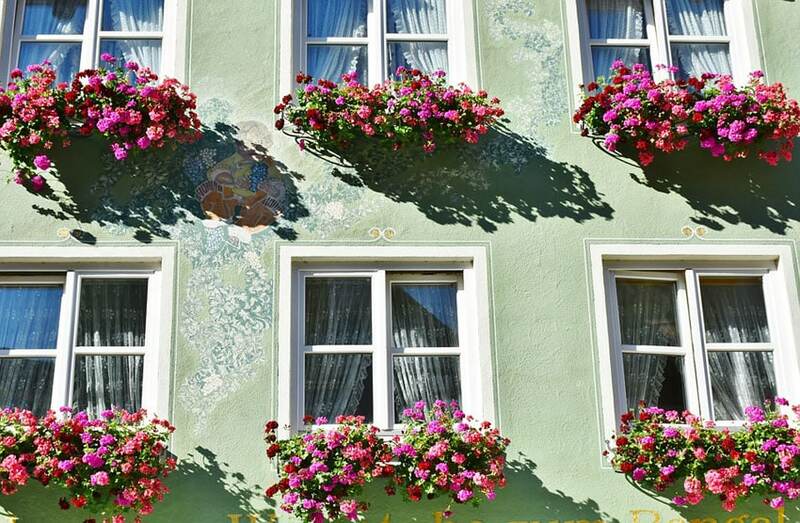 In this article we will be discussing everything you need to know about window flower boxes, its types and some ideas which can help you decide which one is the best for your home. 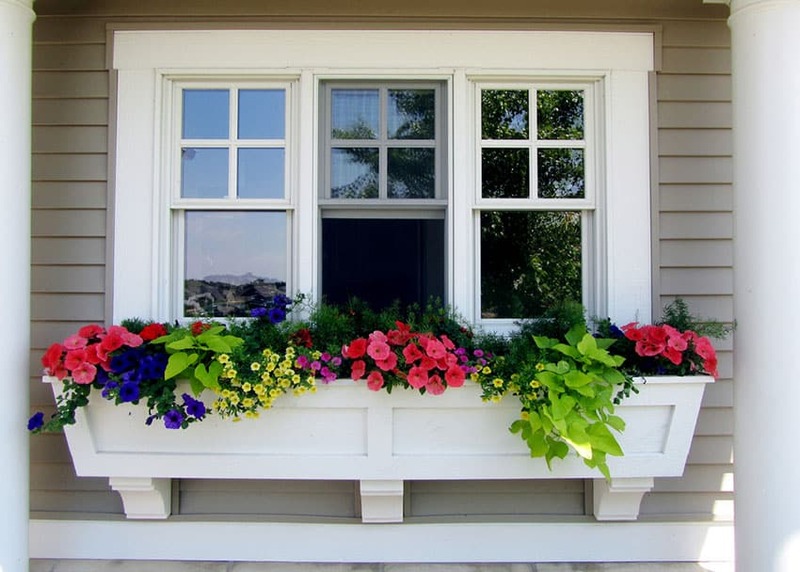 Window flower boxes hang on balconies and along window sills are the easiest way to add curb appeal to your home. Just grab a container, fill it with an interesting mix of foliage and flowers and voila! An instant upgrade for your home’s exterior. 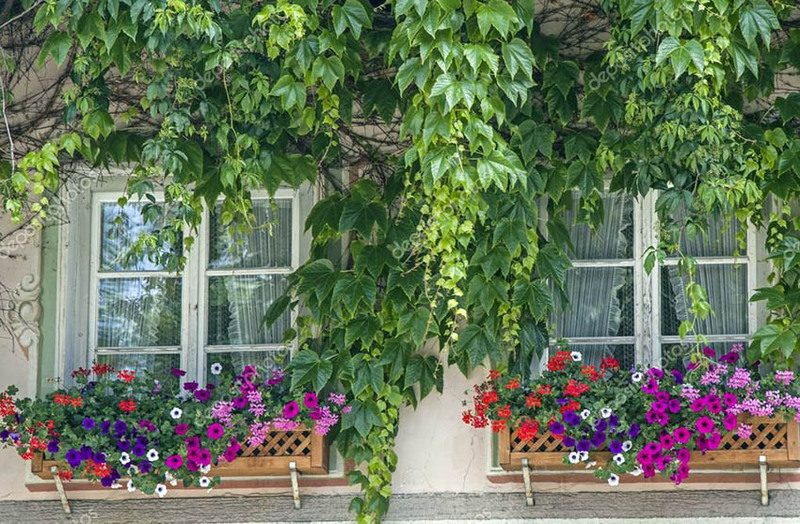 There are a number of other benefits that you can get from hanging window flower boxes at your home. Its primary advantage is it beautifies and adds aesthetics to your home. From the exterior view of your house, it makes the structure more appealing which makes it more desirable if you plan to resell. A flower box adds cheer and livens up balconies and windows making your place more warm and inviting. It is also an inexpensive home decor which is readily available anywhere. Aside from that, it provides convenient way of gardening as it eliminates the messy and gritty work, such as digging plot holes. Window flower boxes are also highly suitable for homeowners with limited spaces because it allows you to enjoy a garden even if you do not have a backyard or lawn. What are the common materials for window flower boxes? By definition, a window flower box is any plant container used for growing plants in and around the home often attached to a window, ledge or balcony. It may be a DIY home solution or a store bought container which is fixed, wall mount or simply set atop the exterior of a home. It is ideal not only for growing flower and small plants but also for cultivating herbs which can be easily accessed. Window flower boxes are available in a wide range of materials and each has its own positive and negative features. 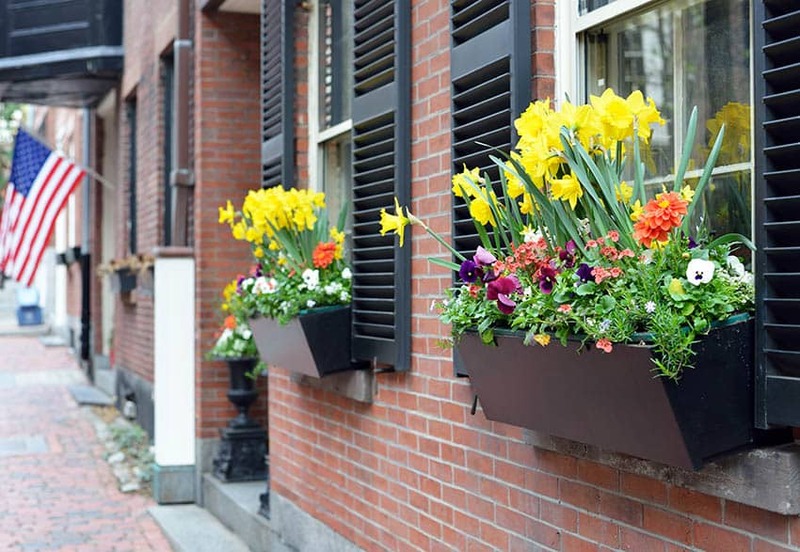 The most important factor to consider in choosing your window flower box is weather as these planters are constantly exposed to outside elements such as the heat of the sun, rain, snow or frost. 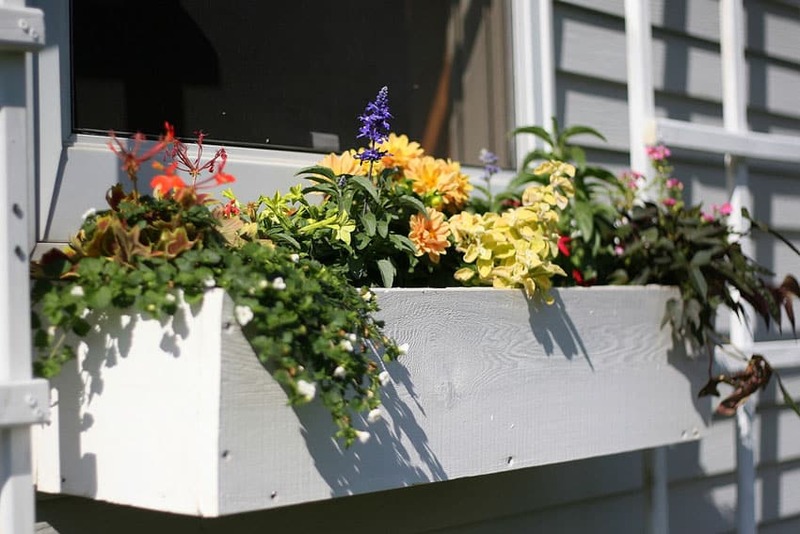 The most common window flower boxes is made up of wood, while other modern alternatives are plastic, resin and fiberglass which are all well loved because of the durability and light weight. Flower boxes which are made up of metal and wrought iron are also desirable options because of their sturdiness and ability to hold weight. “Cache pots” or decorative planters which are used to hold plant pots are also usually used as window flower boxes and are readily available in the market. Other material options are zinc, copper, terra cotta, stone, clay, iron, tin, ceramic and wire. When choosing a window box for your home, opt for a material which best suits your needs. In terms of style, the key design guidelines that one must consider are: first, it must harmonize well with the overall look of your house and second, the size must be proportionate to your window. It is usually 20 to 25 % of the total height of your window and has a typical depth of 8 inches to hold an adequate amount of plant selection. When deciding on the arrangement of flowers in your window flower box, plants must not be too overcrowded and there must be enough space for them to grow. Also keep in mind that a well planned window flower box has a combination of height and width so choose your plants carefully. Research first before selecting so you can get an idea if they are suited to be grown in your location and if they can thrive on the spot you place them on – whether it is exposed to full sun or partial shade. Lantanas – Lantanas are a type of annual, perennial plant which are highly suitable for growing in areas with warm climates. 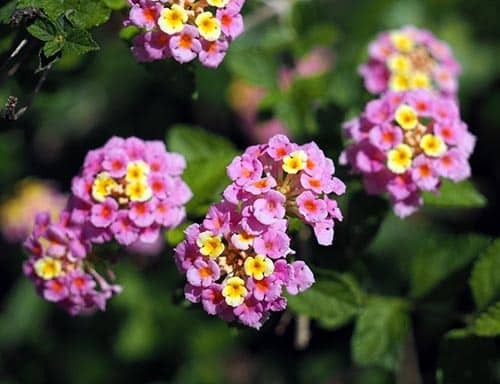 Characterized by small flowers which grow from 6 inches up to 8 feet tall, Lantanas are appropriate for growing in sturdy and wide containers because they can also spread up to 4 feet wide. It has a sweet fragrance which attracts birds, butterflies and bees. In terms of maintenance, this type of flower is easy to care for requiring only an inch of water supply per week. This tropical plant has bright blooms which are usually bright pink, purple, peach, orange, yellow, red, white and blue. It also comes in a “dwarf variety” which reaches up to 16 inches only. It most popular variants are Bandana Cherry Lantana (yellow orange with cherry red) Bandana Pink Lantana, Irene Lantana (multicolored clusters of yellow, red and pink), Landmark Pink Dawn Lantana (a mixture of yellow and light pink), Lucky Pot of Gold Lantana (yellow) and Lantana Montevidensis (lavender). Pelargonium – Pelargoniums are a popular choice for window boxes because they look good all year round. 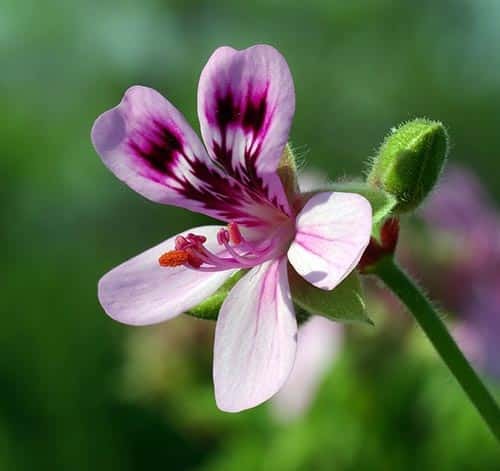 Also known as the common annual Geranium, this type of perennial usually grows from 6 inches to 3 feet tall and up to 2 feet wide. It is drought tolerant which makes hit highly suitable for window flower boxes which are fully exposed to the sun. They are considered to be durable because they can resist diseases and can thrive all season. It comes in different shapes and sizes of blooms, and has a wide range of colors such as pink, purple, orange, red and white. Its most popular variety is the “Zonal Geranium” which has a band of dark color on the leaves. Maintenance wise, Pelargoniums require only little effort to maintain. 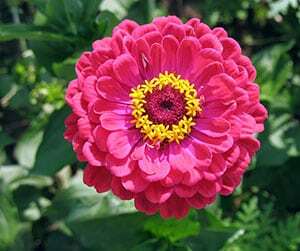 Zinnia – Zinnias are a popular cottage flower for window boxes because of their long lasting color and ability to thrive even when exposed to the full sun. They usually come in a wide variety of colors like orange, peach, pink, white, yellow, red, purple, light green or 2 toned / multi-colored. It also has a single petaled or layered petal variety and can grow up to 18 inches in height. Requiring low maintenance, Zinnias only need a well drained soil with consistent moisture in order to fully bloom. It is also easy to grow which makes it highly suitable for beginners in gardening. Geraniums are well loved choices for window flower boxes because they can withstand the hot weather and need the full sun to fully grow. Marigold – Also known as Tagetes, this type of annual plant is characterized by bright colored blooms which are usually yellow, orange, deep red, gold and copper. They are a well loved choice for window flower boxes because they bring warmth and an inviting feel. In terms of appearance, some of its varieties resemble daisies and carnations. Marigolds come in four different types namely the Single type which looks like daisies and has long stems, African Marigold which grows tall flowers, French Marigold which is the “dwarf” variety and the Triploid type which is the multicolored variety and hybrid of African and French Marigold. These flowers are low maintenance because they only have to be watered when the weather has been dry for more than 2 weeks and they can grow even without the use of fertilizer. They can withstand the heat of a full sun and very hot summers. They can also survive in both dry and moist soil. Agelonia – Angelonias are annual flowers which come in a wide variety of colors such as blue, purple, pink, red and white. It is available in a “dwarf variety” and a large variety which has full blooms. It usually grows up to 1 to 3 feet in height reaching its peak during summer and its growing habits are diverse because they can either grow upright or spread horizontally. These flowers are drought tolerant which makes them highly suitable for container gardening in areas exposed to the heat of the full sun. When placed in shady areas, they do not bloom fully and are exposed to more diseases. Its most common varieties are the Angelmist Dark Plum Agelonia (deep purple), Archangle Purple Agelonia (which has large flowers), Serena White Agelonia and Angelmist Lavender Agelonia. Pentas – Pentas bloom for a full summer and can withstand even the hottest weather. They are usually grown as annuals in plant containers and have a height of 6 inches to 8 feet tall. Characterized by small flowers which are usually pink, red, white or blue. This type of perennial attracts birds and butterflies which make it a charming addition to gardens and window flower boxes. 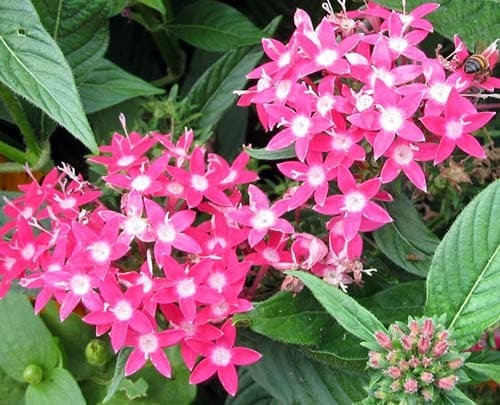 Its most common varieties are the Graffiti Lipstick Pentas (bright pink), Graffiti Red Lace Pentas, Graffiti White Pentas, Kaleidoscope Appleblossom Pentas (baby pink flowers which grow up to 18 inches tall), Northern Light Lavender Pentas and Butterfly Light Lavender Pentas. 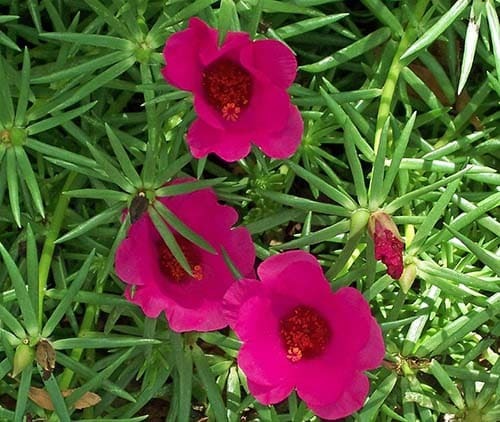 Moss Rose– Also known as Portulaca, it is characterized by needle like leaves and small bright flowers which are usually pink, red, orange and white. Grown as annuals, it usually has a height of under 6 inches to 12 inches and can spread up to 12 inches wide. It can thrive even in the driest hottest conditions, and can withstand drought, heat and bad soil with little maintenance.They are perfect for adding warmth and charm to window flower boxes. Its most common varieties are Sundial Fuchsia Moss Rose,Sundial White Moss Rose, Sundial Yellow Moss Rose and Sundial Peppermint Moss Rose ( white with stripes of bright pink). Some other flowers which do well when exposed in direct sun are: Blanket Flower, Russian Sage, Lavender, Purple Coneflower, Gerbera Daisy, Asters and Nasturtiums. Verbena – Verbena is a type of spreading plant popularly used for adding charm to balconies, pots, baskets, trellises, perimeter walls and window boxes. This type of perennial usually has a height of 6 to 13 inches and grows up to 20 inches wide depending on its species. Grown as annuals, it has a long blooming time. It is perfect for container gardening because it is easy to maintain requiring only an inch of water supply per week. Also, they do not feed heavily on fertilizers and can thrive on once a month application. Verbenas also need the full sun to bloom which makes them drought resistant and suitable for areas with hot climates. Another unique characteristic it has is its sweet fragrance which attracts butterflies. 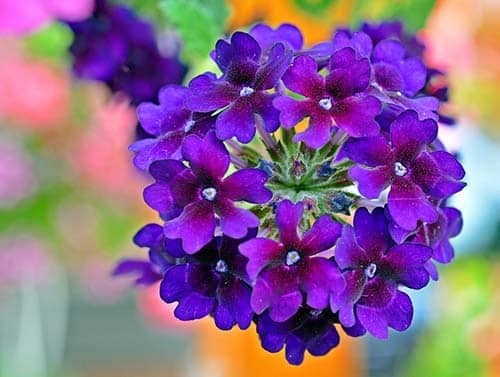 Its most popular varieties are Aztec Red Verbena (red flowers with beige center), Babylon White Verbena (known for being disease resistant), Fuego Pink Verbena, Fuego Red Verbena, Fuego Dark Violet Verbena, Lanai Lavender Verbena (striped white and purple flowers) and Peaches and Cream Verbena. 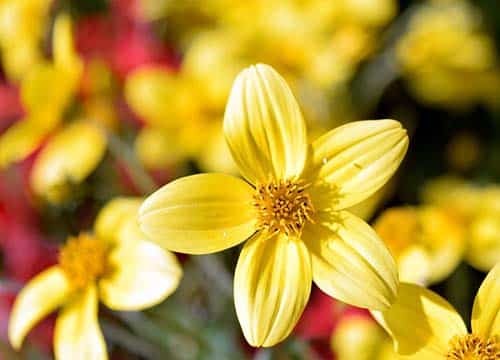 Bidens – Bidens are characterized by its fern like foliage and small five petaled yellow flowers which look like small bright golden stars. Grown as annuals, it is usually 6 to 36 inches tall and spread 12 to 16 inches wide. 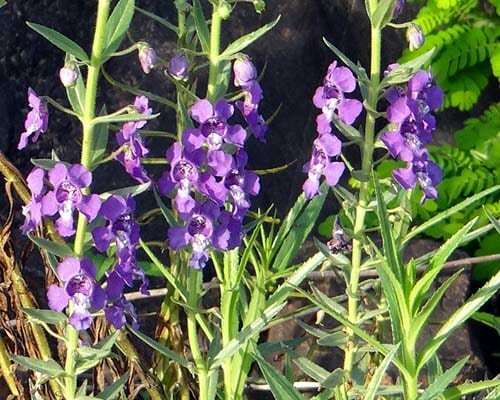 It has a sweet fragrant scent which attracts butterflies and birds. Its delicate appearance make it an ideal choice for adding charm and warmth to windows and container gardens. In terms of maintenance, Bidens need moist, well drained soil and full sun exposure. Petunia – A classic favorite for window boxes and container gardens, petunias are bedding plants which have trumpet shaped flowers and hairy leaves. They look good in flower boxes because they are prolific bloomers which grow in mounds and usually spill over the sides of the container. Petunias come in a variety of colors like white, blue, purple and pink. It is also available in different varieties such as the single and double blooms, ruffled or smooth petals, solid or veined colors. Petunias with large flowers or grandiflora” are perfect for pots and planters while small variants are highly suited for hanging baskets. Although they bloom all throughout the summer season, they can not withstand extremely hot weather. 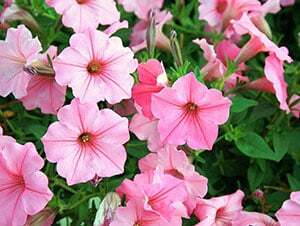 Petunias need partial shade to full sun in order to grow. Maintenance requirements include regular watering for constant moisture and well drained potting soil. 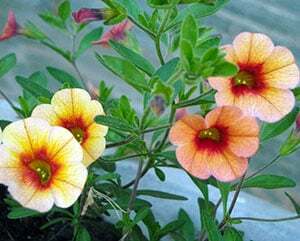 Calibrachoa – Also know as Million Bells, they resemble tiny petunia flowers, and are a popular choice for container gardening because they cascade beautifully when fully grown and look good in almost anything – whether they are hang, grown alone or mixed with other plants and flowers. Calibrachoas come in a variety of colors which range from light white, soft pastels of pink, rich colors like magenta, blue and purple, to warm shades of orange, red and yellow. They usually have a height of under 6 inches and can spread anywhere from 12 to 14 inches wide. One advantage of growing Calibrachoas is that they can withstand heat and cold. Maintenance wise, there is no need to remove dead blossoms because they replace it quickly and since they grow fast, they are considered to be heavy feeders. 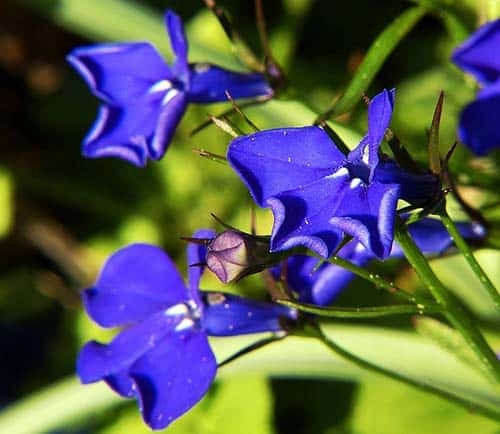 Blue Lobelia – Blue Lobelias are a type of cascading flowers which spread like waterfalls when placed in containers and window boxes. The fully bloom during cool seasons such as spring and fall and need only partial shade. Grown as annuals, they have a height of under 6 to 12 inches and can spread horizontally for up to 12 inches. Characterized by blue and white flowers, they have different varieties which fall on the same color spectrum. Its most popular varieties are the Blue Wings Lobelia (large blue flowers), Lucia Dark Blue Lobelia (known for being heat tolerant), Regatta Sapphire Lobelia (blue flowers with white center), Regatta Rose Lobelia (carmine flowers with white center), Riviera White Lobelia, Riviera Blue Lobelia, Riviera Midnight Blue Lobelia and Magadi Blue with White Eye Lobelia (blue flowers with white throat). 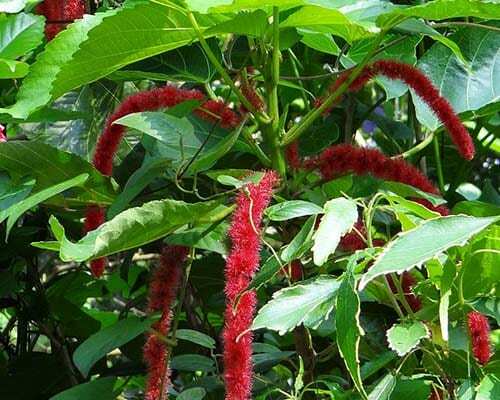 Chenille – Named after the French word for “caterpillar’, Chenille is characterized by long fuzzy crimson red flowers. Also known as “red hot cattail” or “monkey tail”, this type of flower is perfect for adding an interesting variation in texture for sunny window box gardens. Chenille flowers grow uniquely because they turn downright and reach up to 18 inches in length. It thrives in hot weather and fully blooms in tropical climates. 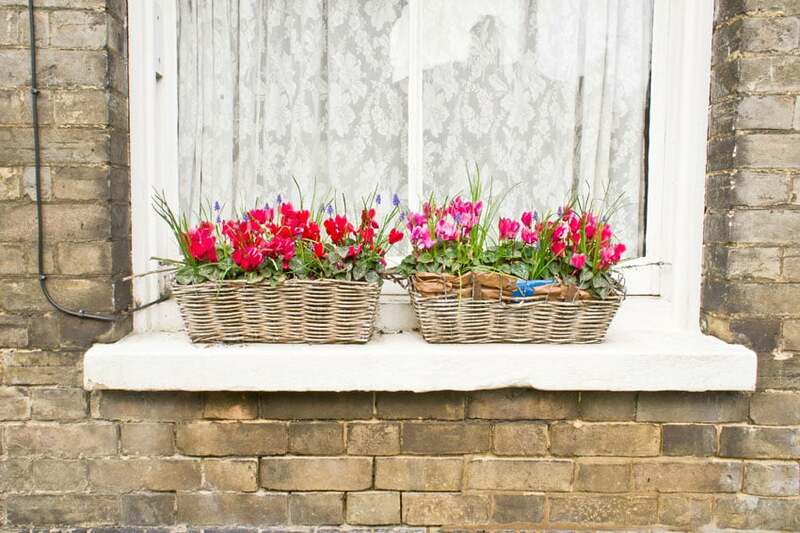 However, it is more tamed in window boxes because it only grows up to 3 feet when placed in a limited amount of space. It needs the full sun to grow and regular fertilizer application because it is fast growing. It can also be planted in different soil types such as clay, sand and loam. 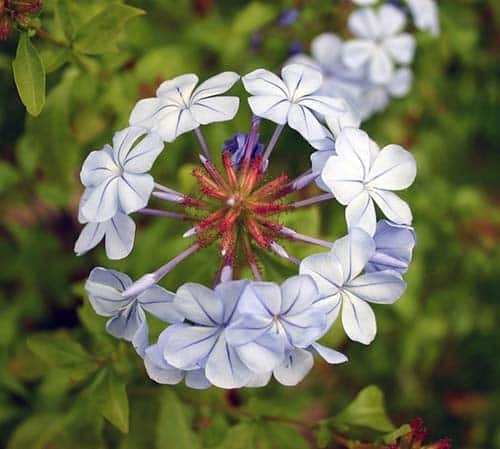 Sky Flower – Also known as Plumbago, Blue Plumbago or Cape Plumbago, it is a type of shrub which can grow from 6 to 10 feet tall and spreads up to 10 feet wide. It is characterized by small pale powder blue flowers and long thin stems. It thrives in heat and grows year round even in areas with mild winters. Sky Flower has very specific requirements in terms of maintenance. It needs light well drained soil which has consistent moisture. Newly planted ones require to be watered more often, but as soon as they bloom, watering can be reduced and is needed only when the soil is dry as it can suffer from “soggy feet” when exposed to excessive moisture. It also needs monthly fertilizer feeding to promote growth and blooming. To get a full fountain shaped cascade as it grows, make sure to plant Plumbago with an even space. This rustic window and balcony is accentuated with graceful pink cascading flowers which complete the “old world” charm of this home. A subtle contrast to the green shutters, it brings charisma and appeal to the overall look of the building. Purple petunias are a popular favorite for window boxes because they cascade beautifully as they grow. Aside from their bright colors which brings life to windows and entryway of the house, they are also heat tolerant and perfect for spots which are exposed to direct sunlight. 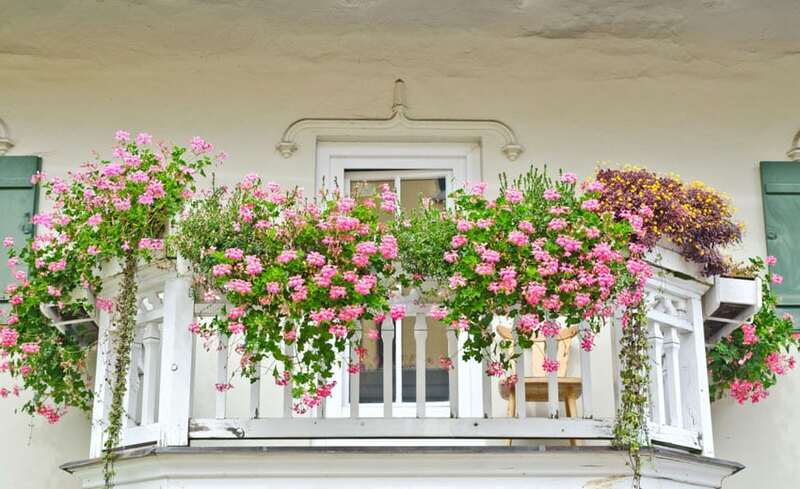 Hanging flower boxes along balcony railings is one of the most basic and simplest way to add curb appeal to your home. 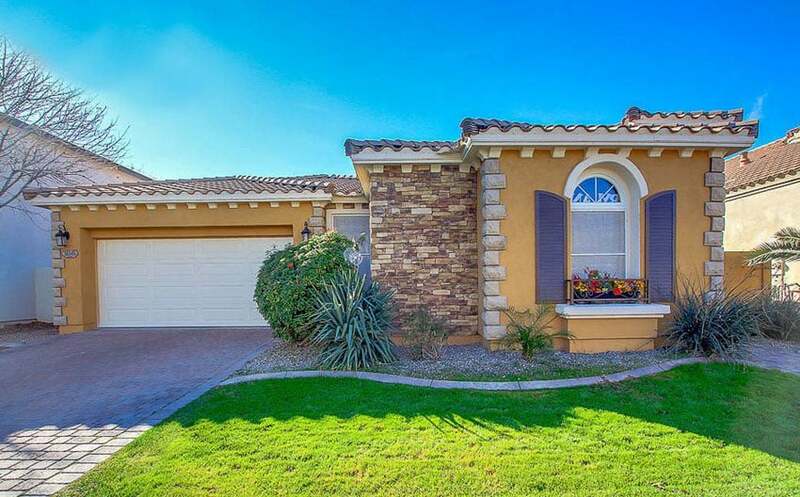 A view of luscious blooms and verdant green foliage atop your house’s exterior is very desirable, aesthetically pleasing and gives off a warm inviting and refreshing feeling. 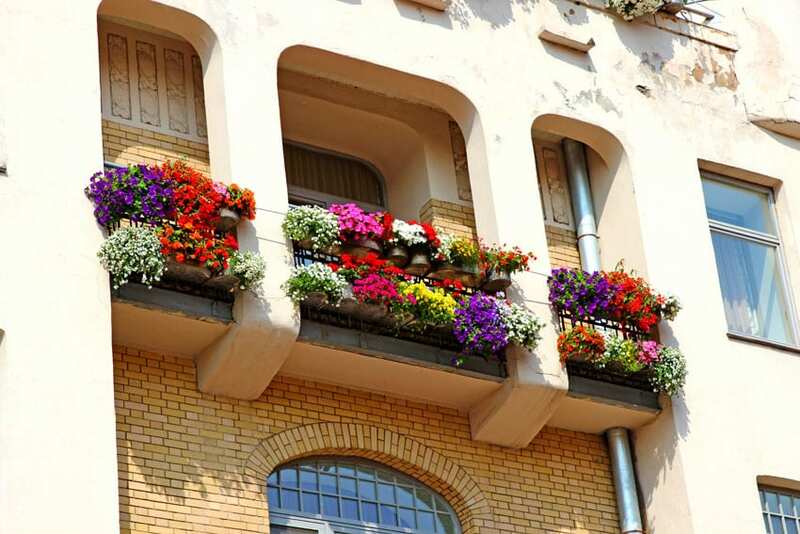 Balcony flower boxes are usually free standing or ready made plant containers which are fixed to the balcony railings. It comes in plastic, resin, wood and is readily available in most local home improvement stores. Cascading flowers and trailing vines are perfect for this type of flower boxes because it takes advantage of the height. 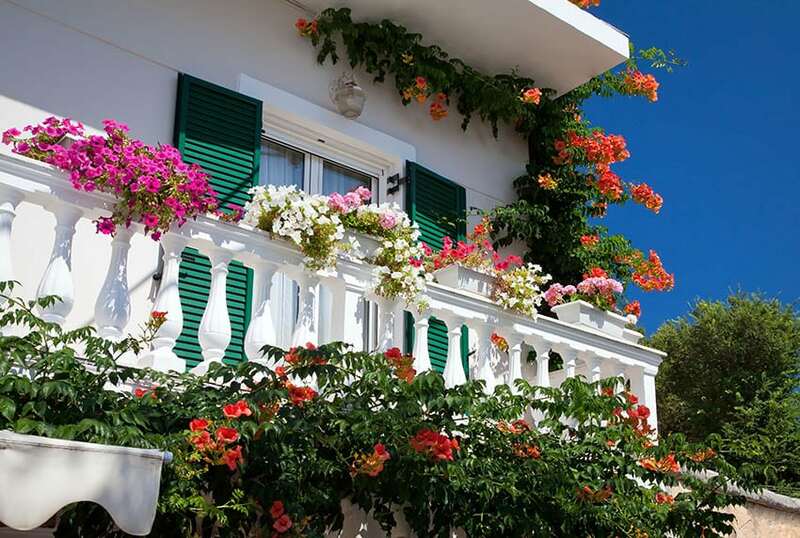 The balcony of this building are adorned with a bright mix of full blooming geraniums and calibrachoas. The large pots of flowers hang on this balcony instantly soften the texture of the architectural features of this structure. 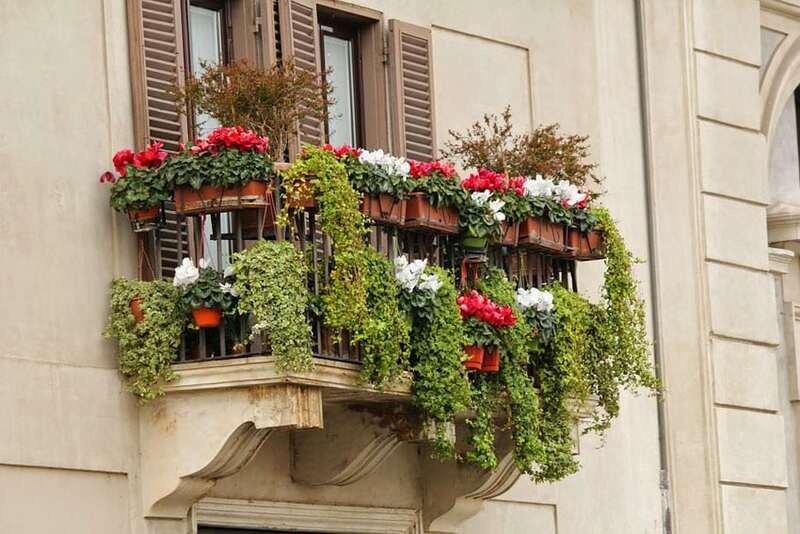 A mixture of spilling vines and potted red and white flowers bring this balcony to life. The beauty of using window flower boxes is that it allows homeowners who live in apartment buildings or condo to make the most of their limited space, eliminating the need for a lawn or backyard for gardening. 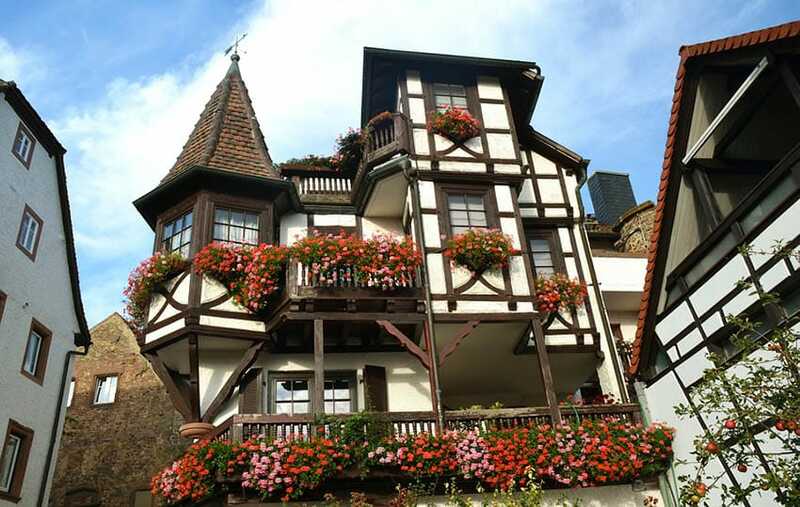 This traditional “floral house” is ornamented with cascading red and pink ivy geraniums in the windows and balconies. The look of the house is oozing with charm and appeal because of the addition of these luscious blooms. 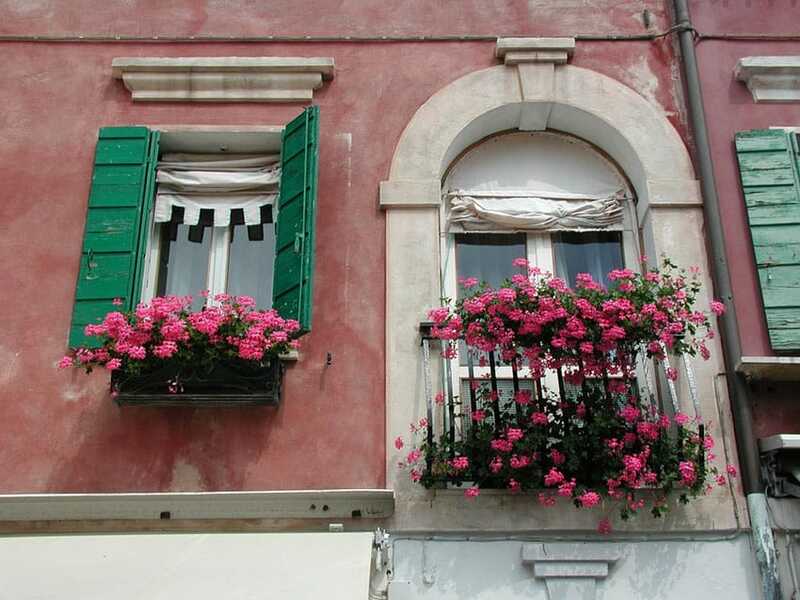 A mix of pink, peach and red pelargoniums highlights the small balcony of this house. 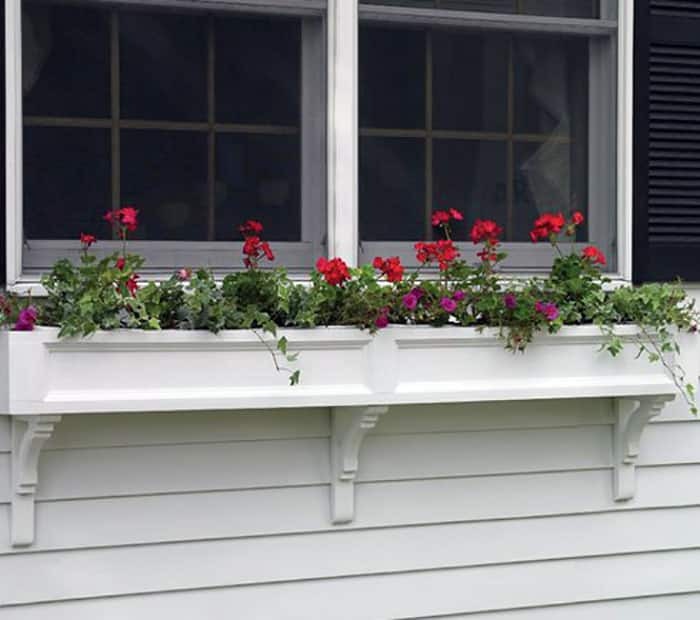 Store bough plastic rectangular containers, such as the ones shown above, are perfect window boxes because they can be easily mounted to steel railings and won’t fade even when exposed to constant weather changes. 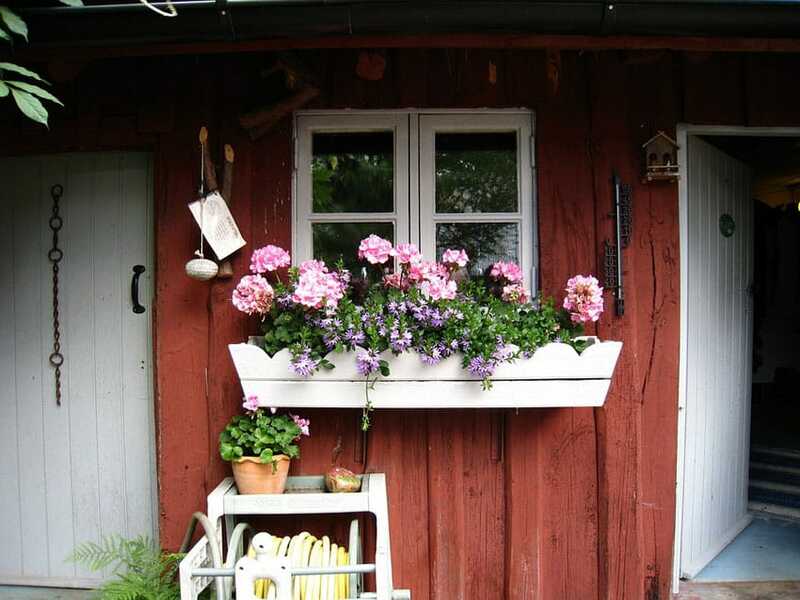 Wooden window flower boxes are a popular choice because of their natural beauty. Its benefits include versatility in design, durability and inexpensiveness. Although prone to rot, decay and pests, there are some wood species which are naturally resistant to these elements making them perfect choices for window flower boxes. 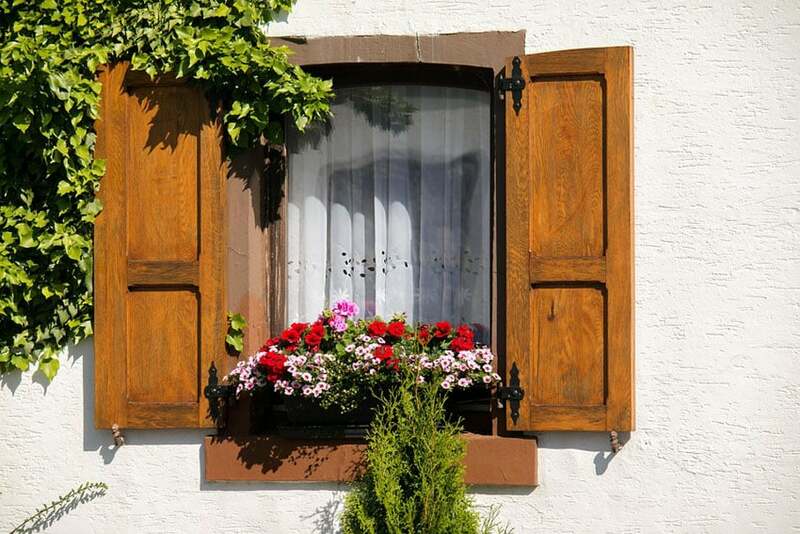 The most common wood species used for window flower boxes are Cedar and Cypress because they produce natural oils which make them rot, insect and weather resistant, as well as highly resilient when wet. Teak, Mahogany and Redwood are also excellent choices but expensive. Pine is not a good option because it rots , while Oak should also be avoided because it turn black when exposed to water. 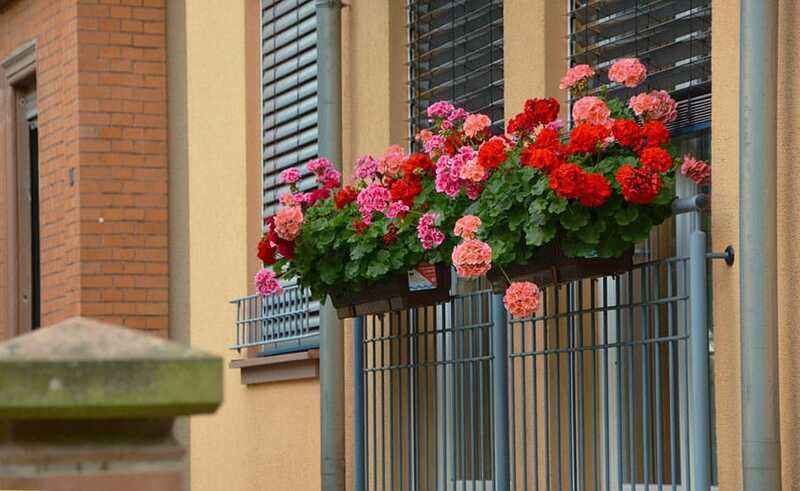 Aside from wooden flower boxes which are fixed on window sills, the facade of houses can be decorated with a combination of different pots, planters and hanging baskets. Container gardening allows homeowners to be creative as it can be arranged and relocated easily. 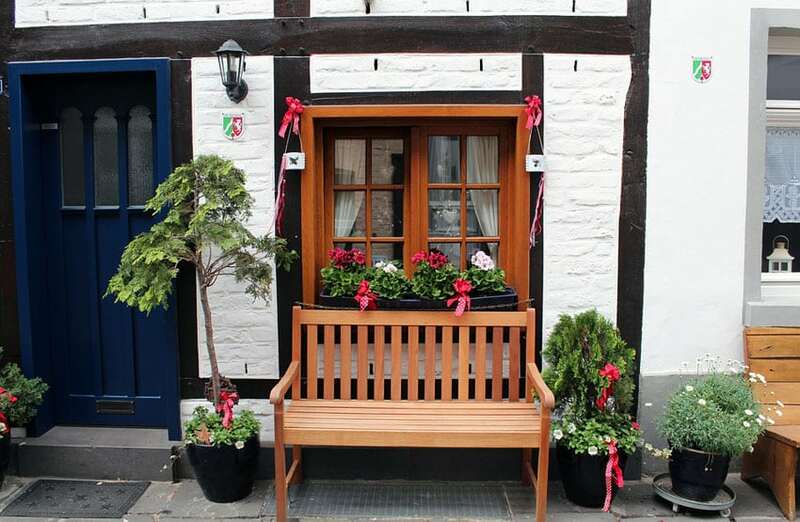 This wooden picket fence style flower box is a dainty charming decoration to the window of this house. Rectangular wooden window flower boxes are perfect for holding a large variety of flowers and plants as they provide ample space for growth. 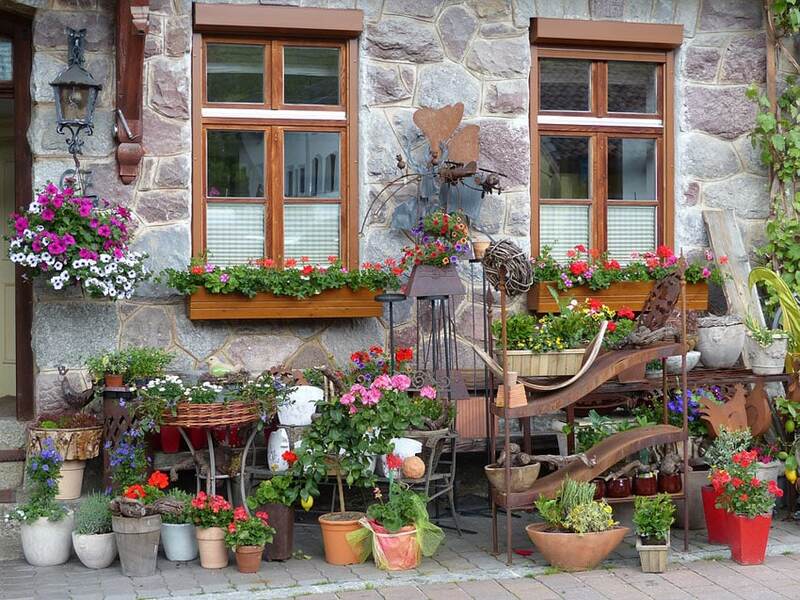 Metal racks which houses pots of flowers and plants are fixed on the sidings of this house. Perfect as window boxes because they can hold the weight of watered down containers. Creating your own window box from scratch is an easy “Do it Yourself” project that does not require much time and effort to accomplish. Aside from being iexpensive, building your own window flower box allows you to customize according to your needs and decorate according to your personal taste in style. • Measure your window. Using a tape measure, accurately measure the width of your window to determine the length of your window flower box. Measure from end to end of the window trim and frame. For the depth and height of your window flower box, make sure that it is large enough to accommodate your flower pots and planters (if using any). If your window flower box will be resting on a ledge, you also need to get the depth of the ledge. • Cut and trim the boards according to desired length. Measure the boards and using a pencil mark the lengths of the panels of your window flower box. You will be needing a total of 5 pieces of boards, 1 for the front panel, 1 for the back panel, 2 side panels and 1 bottom board. You can do this yourself or you can ask your supplier to cut it for you. • Cut the brackets. Using a template, mark a piece of your wooden board and cut it according to shape using a circular saw. Ideally 3 brackets are used – one for each side and one in the center, but this will vary depending on the total length of your window flower box. 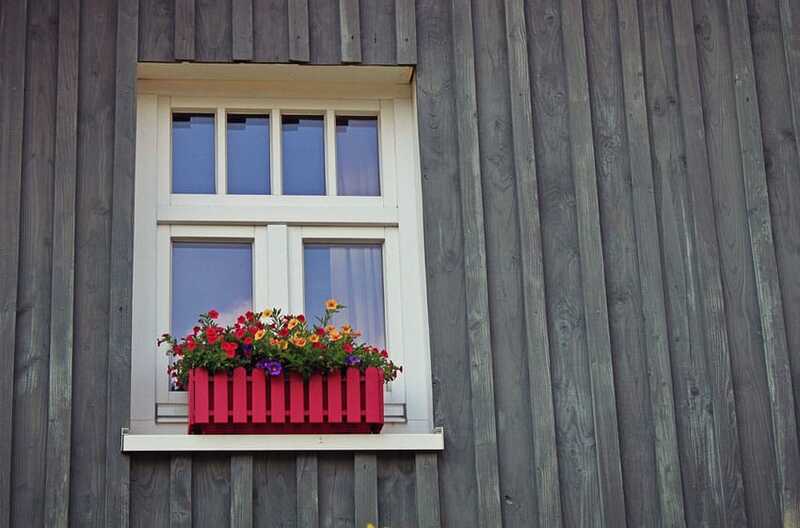 If planning on attaching your window flower box to the sidings of your house, make sure to put notches. 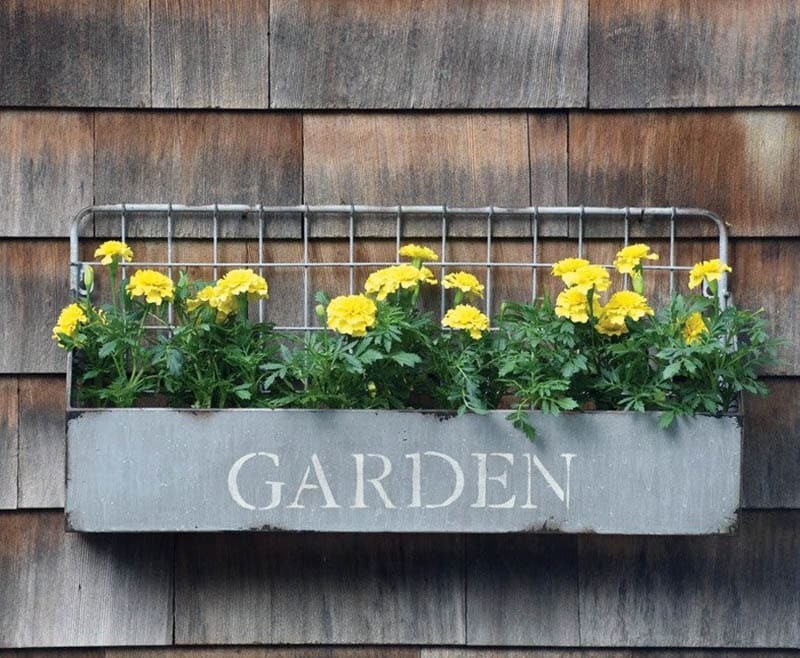 Aside from wooden brackets, you can also use ready made L-shaped brackets or anchors to mount your window flower box. Just make sure that it can support and carry the load of your window box, as well as the extra weight it may incur when watering. • Attach the front and back panel to the side boards. Using an electric drill, drill three pilot holes on the front panel and the end of the side panel, overlapping each other to form a 90 degree angle. The pilot holes must be equally spaced and at least ¾ inches from the edge of the boards. Fasten boards together using a screwdriver or electric drill and some galvanized screws. Repeat the same process for the back panel and the other side panel. Then fasten all boards together to form a box. • Attach the bottom board. Once all side panels are complete, attache the bottom boards using galvanized screws and a screwdriver or electric drill. • Drill drainage holes. Flip your window flower box over and punch 4 to 5 drainage holes on the bottom board with the use of an electric drill. A minimum diameter of ½ inch is the ideal size for drainage holes. • Add finishing touches to the window box. Using a sander or sandpaper, smoothen all edges your window box and apply paint or wood stain as finish. • Attach brackets to the window or wall sidings of the house. Position brackets where the support is needed – one at each end and one in the middle. Make sure that it is properly aligned and attach brackets to the house interior using screws and an electric drill. • Secure window flower box. Place the window box on top of the brackets. • Fill the box with flowers and plants of your choice. If planting directly on your window flower box, insert a piece of vinyl or nylon screen and make sure to drill pilot holes on them too. Or rather than using a liner, you can use “crocks” and fill your plant box with crushed terracotta pots at the bottom. Add potting mix keeping the plant box at least ⅔ full then plant flowers according to desired arrangement. Do not pack the plants to tightly. • The typical depth and height of window flower boxes is usually 6 to 8 inches, but this varies. • Window flower boxes are commonly mounted 6 to 8 inches below the sill to leave clearance for the plants. • In choosing the type of wood for your window flower box, use wood species which are resistant to water damage as these containers are constantly exposed to outdoor elements. Wood is also naturally prone to insect damage and rotting, so make sure to choose something which is resistant to these factors. Cedar and Cypress are the best options because they are both resilient when wet and weather, rot and insect resistant. 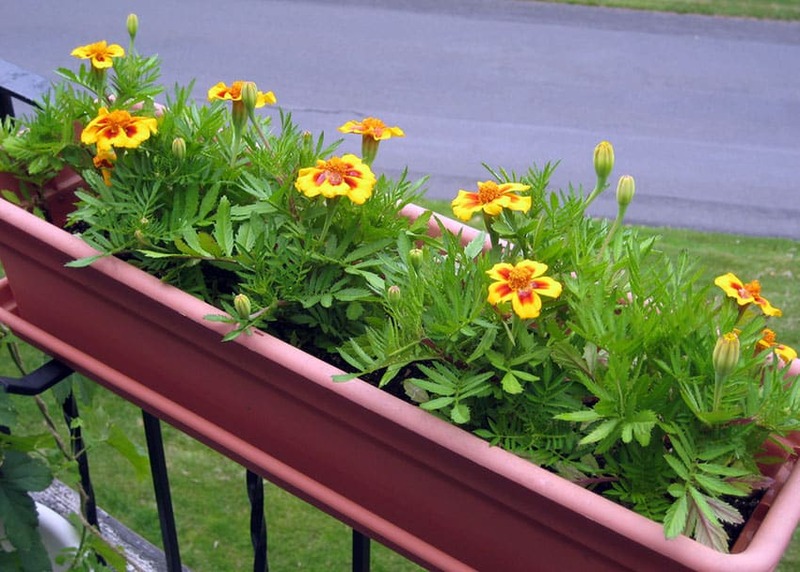 • Choose the right type of mounting hardware for your window flower box. This will depend on the house’s’ exterior facade materials. Avoid expandable anchors for bricks because they cause it to break. Use large anchors for plywood, wood and stucco. • Always use galvanized or rust proof nails and screws. • Drainage holes are very important. Never skimp on drainage holes because it keeps the soil well drained. If your soil is too wet, plants have the tendency to develop diseases such as “soggy feet”. Punch enough holes on DIY planter boxes or if going with store bought options, make sure to check them before purchase. 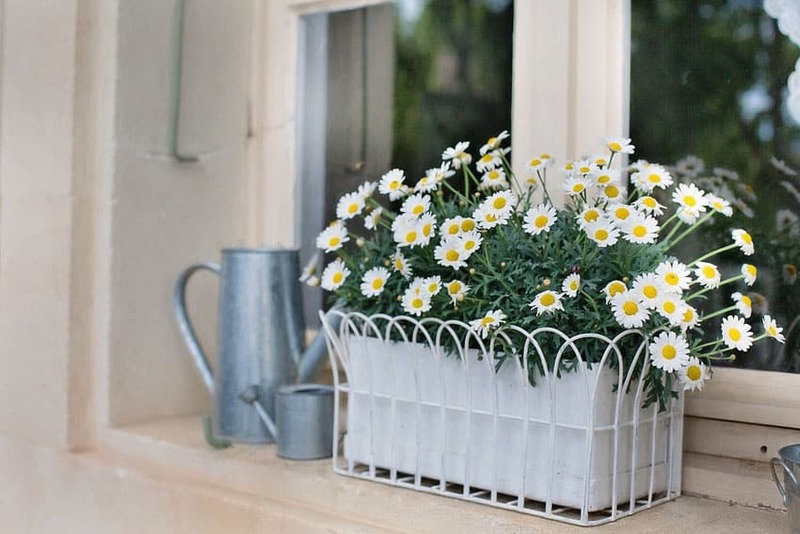 • If planting directly on your window flower box, use a layer of “crocks” to prevent drainage holes from clogging up and to stop the soil from falling out. Wooden window flower boxes are easy “Do it Yourself” projects needing only a few amount of materials. This classic design which is filled with purple and white flowers liven up the entry and window of this rustic farm house. This simple homemade solution for a window flower box is made up of single wooden panels in white paint finish which are joined by nails. Although plain and basic, it still works as a delightful shabby chic decoration for this house. DIY ‘ing allows homeowners to be more resourceful and creative in finding solutions for decorating one’s home. These wooden baskets, for example, are artistically used as flower boxes which give charisma to the rustic brick exterior of this house. Small spaces can be instantly transformed into relaxation corner with the use of blooming flowers in window flower boxes. 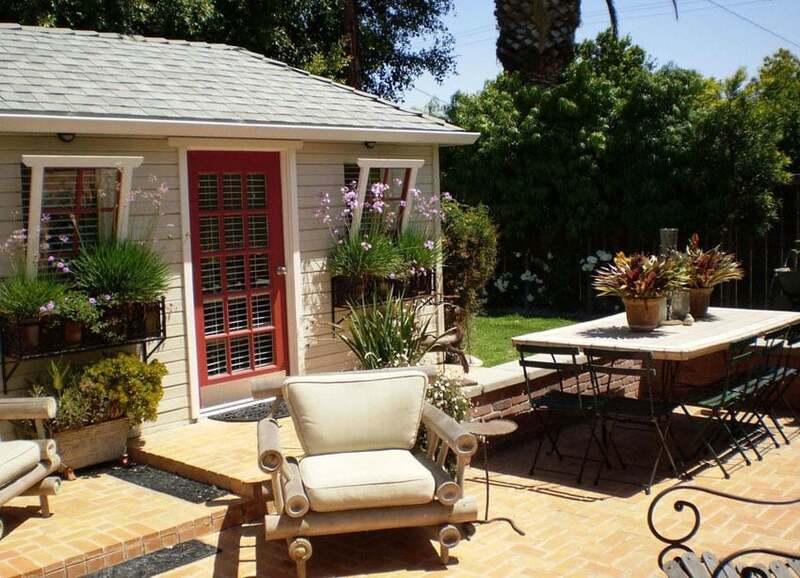 This outdoor living area is more inviting and lively because of the luscious foliage and flowers which surround it. This plastic self watering planter box is durable and has enough room to grow a wide variety of plants and perennial flowers. 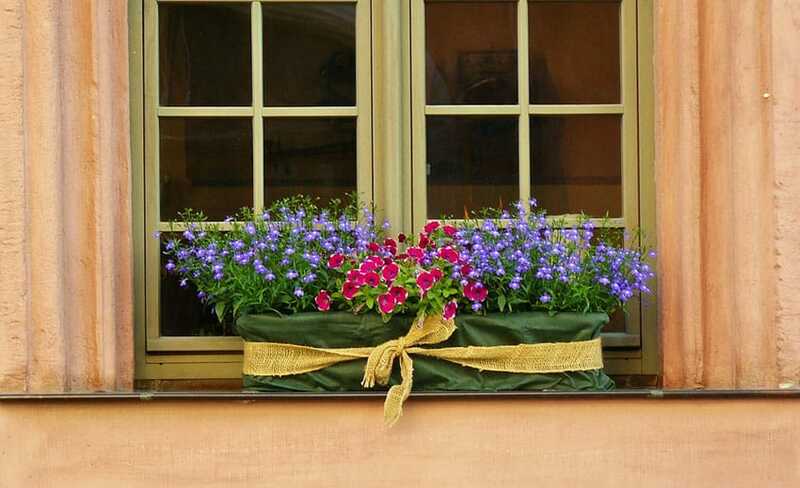 This type of window flower boxes are innovative solutions an modern alternatives to more traditional materials because it has a built-in sub irrigation water system and a self-watering feature which keeps the pants hydrated while encouraging root growth. 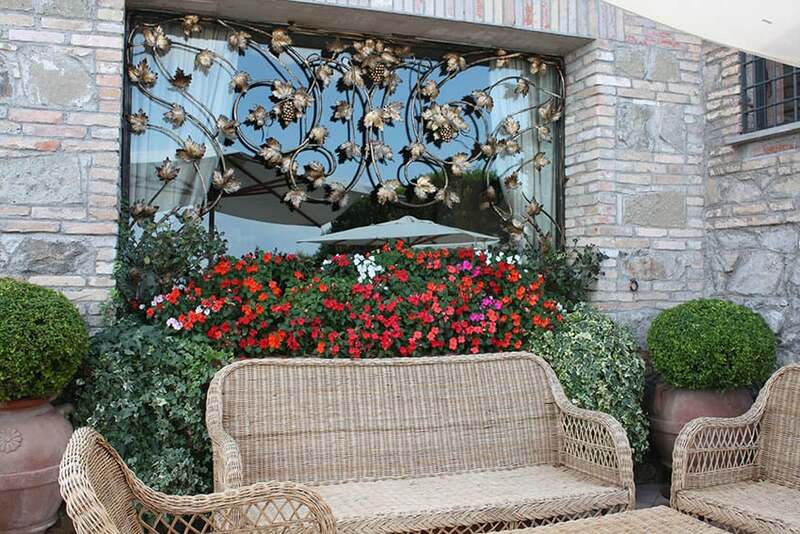 This window flower box design makes use of decorative metal rails which are used to house plant containers. In choosing the right style and material of window box, make sure that it blends and harmonizes with the overall look of your house. A bright mix of pink, lavender and red geraniums illuminate the windows of this building. The stunning contrast of colors and textures between the flowers and the stucco also create a sense of depth in the design of this building’s facade. 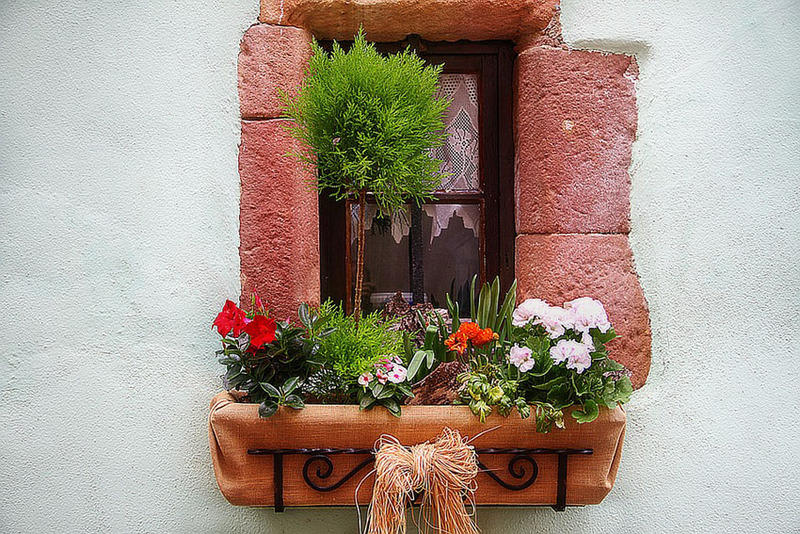 Window flower boxes may be ornamented with additional decorations such as fabrics and ribbons to add more character to outdoor spaces. The beauty of “Do it Yourself” window boxes, such as the one shown above, is that it allows you to customize according to your taste. 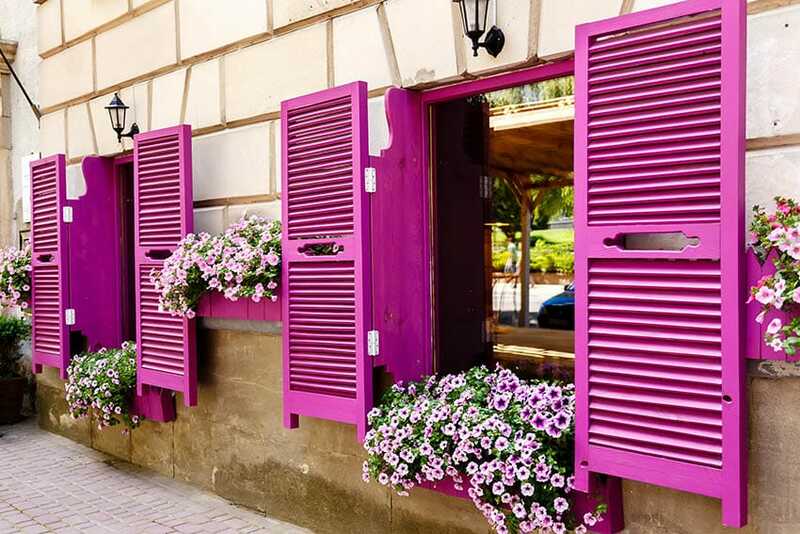 Bold magenta window shutters are complemented with lovely purple and pink petunias. This design is truly a feast for the eyes with its stunning visual aesthetics and pops of color. A mix of calibrachoas and red and pink petunias in simple rectangular window flower box bring charisma to the this traditional cottage. Ready made freestanding plant containers, such as the one shown above, is one of the simplest solutions in upgrading the exterior appeal of your home. Window flower boxes are ideal for small apartments without backyards and limited spaces because it provides a way to increase gardening space. Entryways and front porches are more warm and inviting when decorated with abundant foliage and blooming flowers. 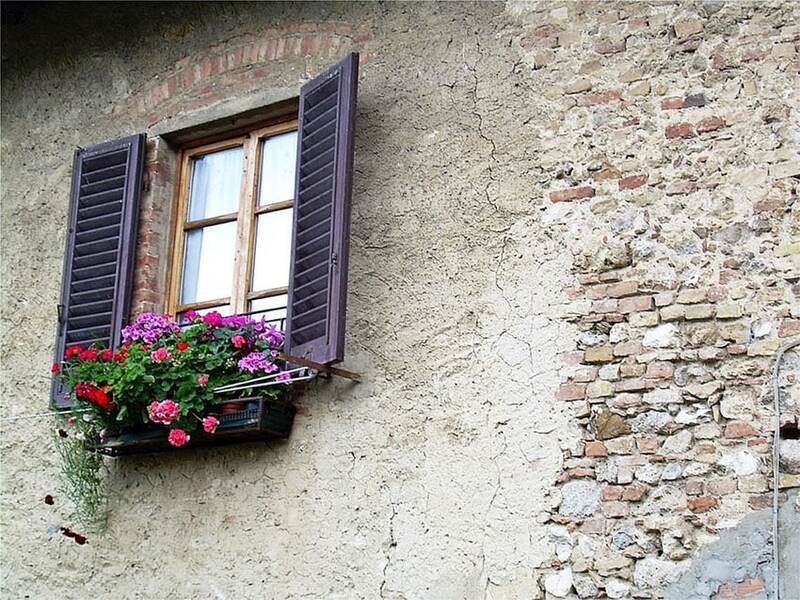 Pots of pink, red and purple geraniums soften the rustic wooden shutters, rough stone and brick exterior of this house. 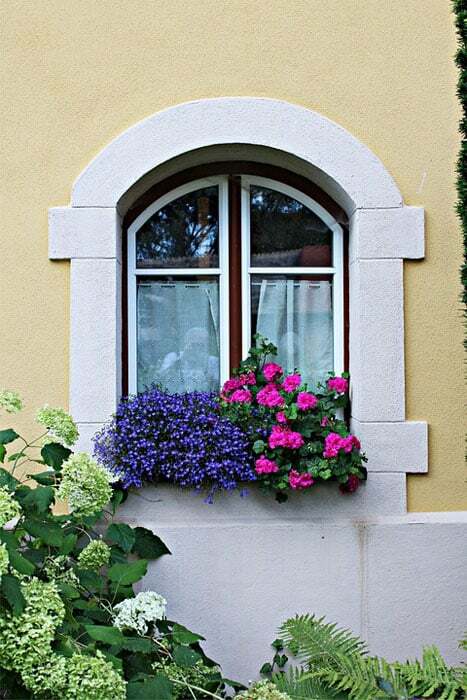 This appealing window flower box brings an interesting contrast in texture and play of colors. 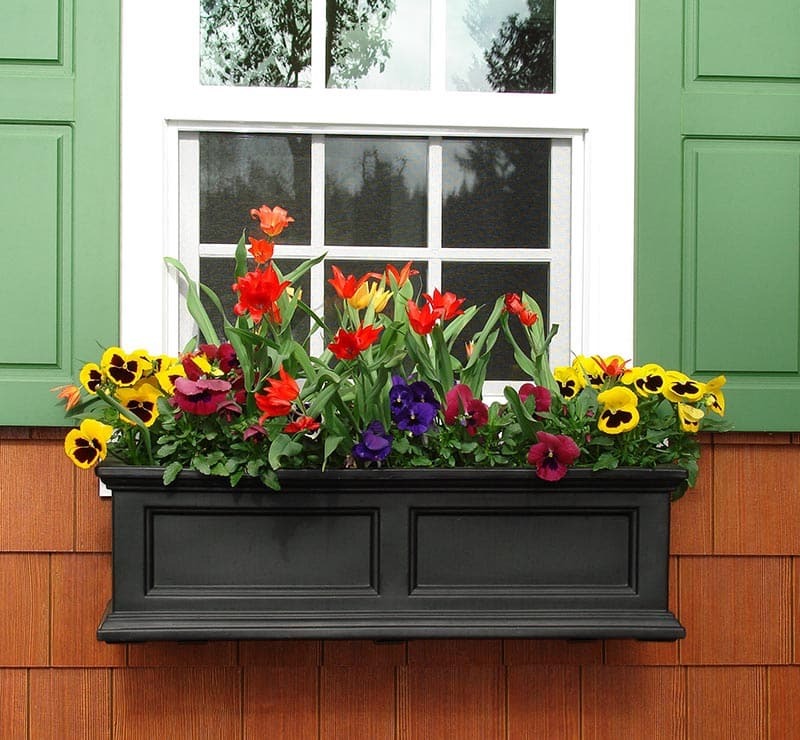 This ready made window flower box is made up of plastic but is made to resemble the appearance of traditional New England style wooden recessed panels. Highly durable and sturdy, it also has a built in sub irrigation system which promotes plant growth. Design wise, it adds a classic flair to windows and houses. This window box design makes use of a fabric cover and is fixed on walls with the use of an ornamental steel ledge, making it a perfect match for the rustic look of this house. The interesting mix of plants and flowers in this window flower box highlights the small window. Ordinary plant containers placed inside decorative metal cache pots are quintessential window flower boxes when adorned with beautiful blooming flowers. Aside from enhancing outdoor spaces, they are functional and easy to move around. 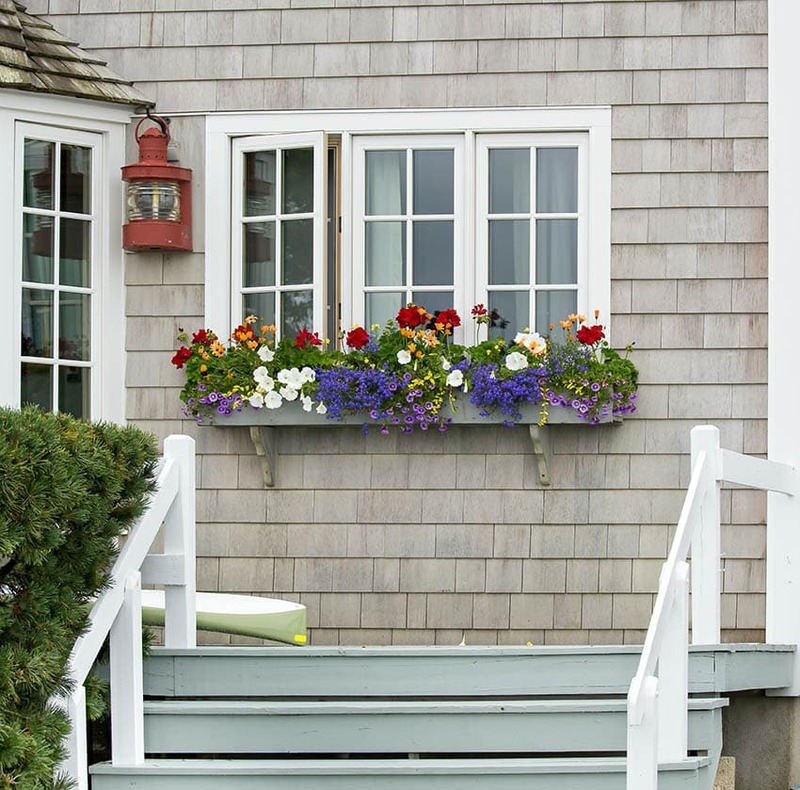 Window flower boxes are distinctive accents for the house exteriors. This design made use of a mix of blue plumbago and pink petunias which serve as the eye catching focal point for this outdoor space. Shown above is a steel window flower box which is set with moss liners and fibers cache pots hold a variety of plants and flowers. 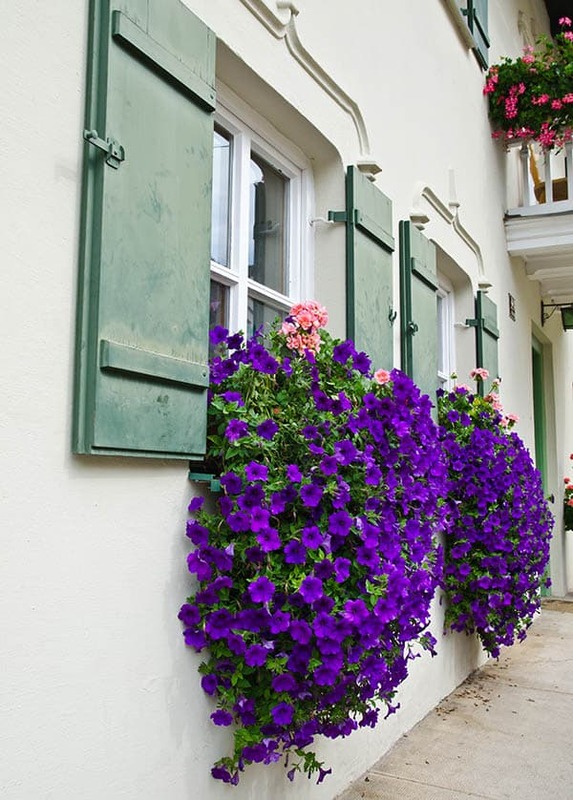 To make your window boxes more interesting, combine different species of flowers with the same spectrum of colors, such as this monochromatic purple mix of petunias, million bells, pansies and trailing vines. This dainty white picket fence window box plant container is adorned with verdant foliage and mini watering pail decors. The addition of a window plant box breaks the dull exterior of this house and creates an interesting combination of traditional architecture and contemporary decorations. 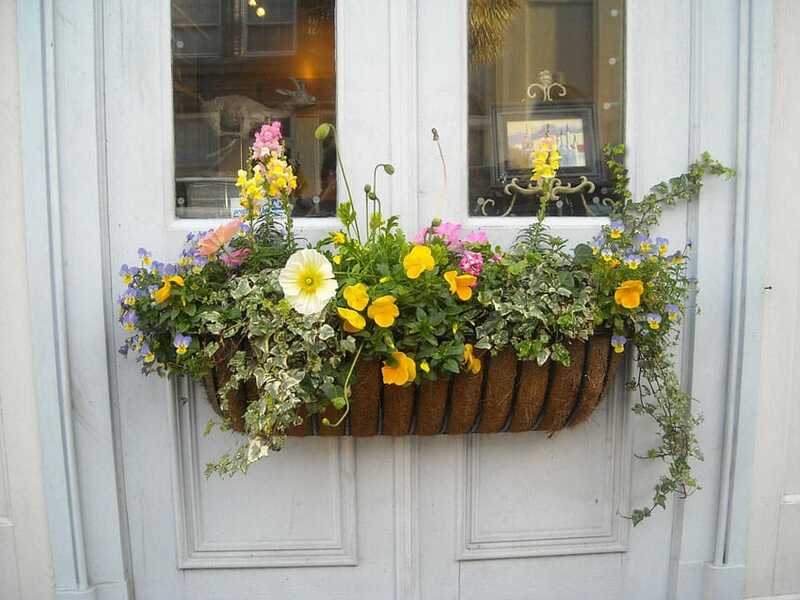 Another type of decorative window flower box which is turning into a trend in the market is the “hayrack”. 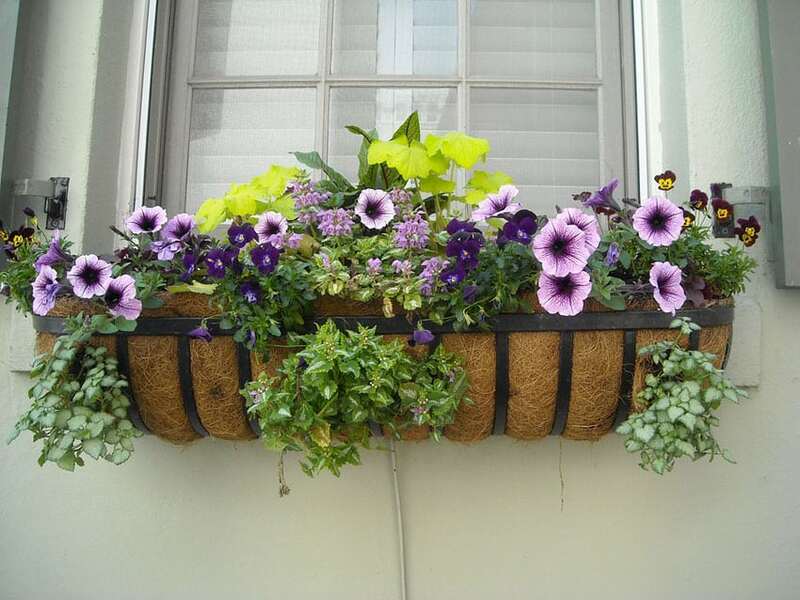 Set with hay fibers or moss liners as “cache pots”, it is a “less boxy” take on the traditional window box planter. This design is highly suitable for holding trailing vines and cascading flowers because it has enough space. It also adds life to the plain color of this house exterior. This metal hanging garden window box is perfect for both indoor and outdoor use as it is durable and can hold the weight of pots of plants and flowers. It is also easy to mount and can be hang in window sills, balconies or house sidings. 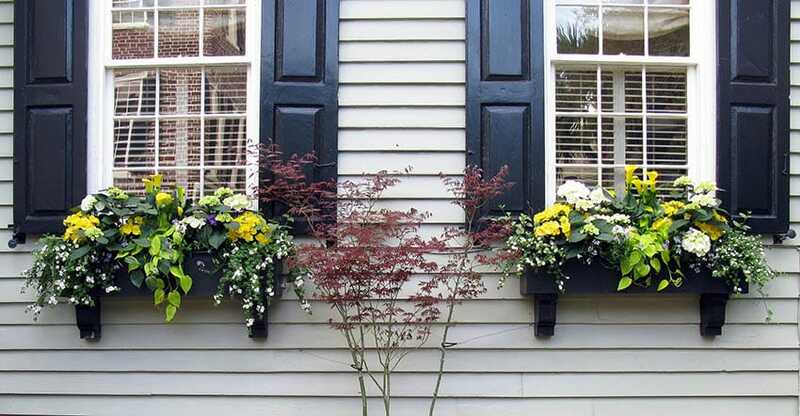 The use of window flower boxes can easily break the heaviness of dark black shutters. To separate the adjacent window boxes, a bright tall red plant is placed in between which serves a the accent for this space. 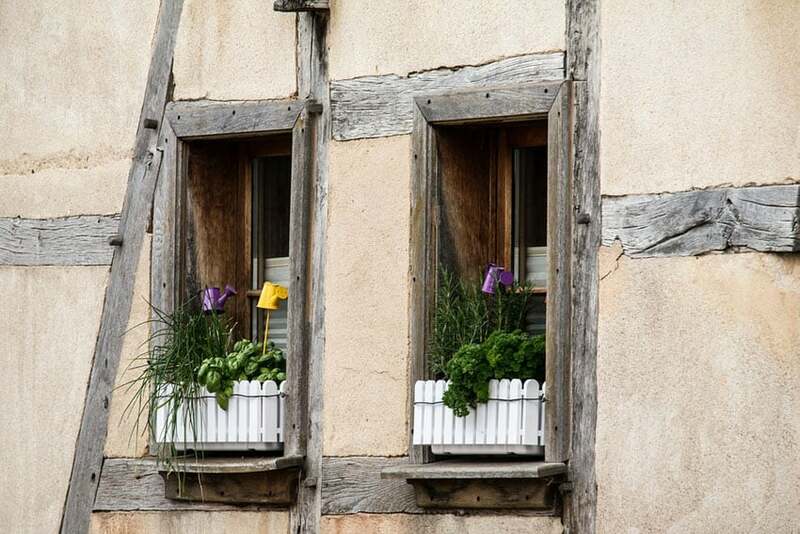 This wooden window flower box is a perfect match for the french windows. 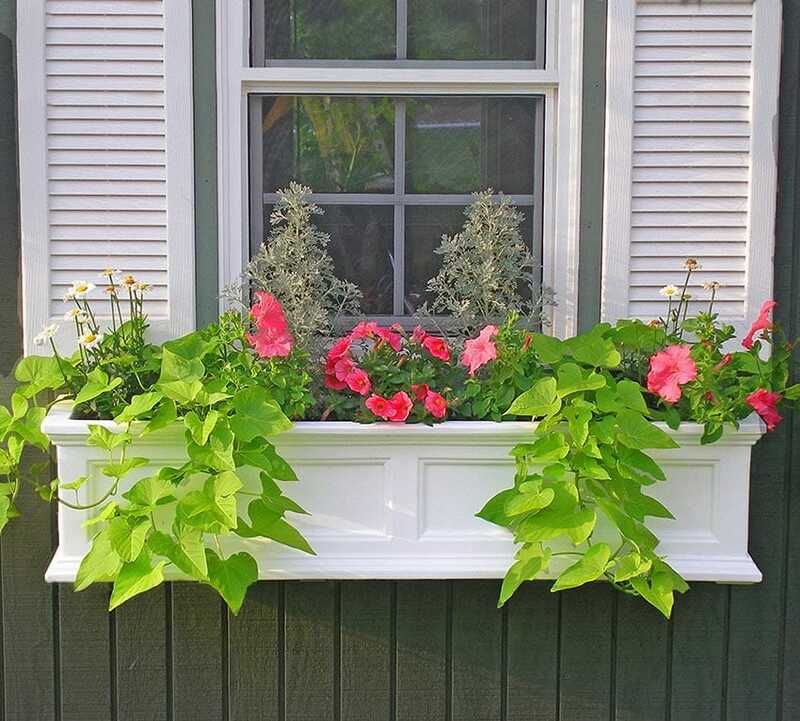 For an interesting mix of plants for your window box, combine a variety of trailing vines for width, foliage for height and a diverse blend of large blooms and micro flowers for that dashing pop and play of colors.